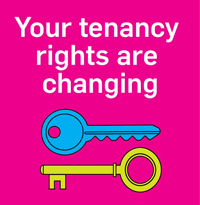 If you wish to change your tenancy for any reason, you should contact your Neighbourhood Office to discuss this. A change of tenancy can only happen with the approval of your Neighbourhood Office. If the change is to a joint tenancy, both tenants must write to us saying that they agree to the change. If your application is unsuccessful, we will tell you in writing the reason why it has been refused. If you are ending your tenancy, you are required to give us 28 days notice. You will be charged rent for this period. If the tenant of a property you live in has died, you may be able to succeed to the tenancy. Some tenancy rights are changing in 2019 due to the implementation of the Housing (Scotland) Act 2014. If I am a joint tenant and the other tenant(s) leave, do I have to pay their share of the rent? My partner has moved out and both our names are on the tenancy agreement. What should I do? How can I get my ex-partner to sign a change of tenancy agreement if I don’t know where s/he is? If I die, can anyone I am living with get the tenancy of the council property we live in? My partner has died and my name is not on the tenancy agreement. What do I need to do? If I have a Short Scottish Secure Tenancy Agreement, will anyone be able to take on the tenancy if I die? The tenant of the house I live in has left. How can I apply for the tenancy? Yes. Tenants are held jointly liable for the tenancy, including the rent. It is your responsibility to tell us if your circumstances change. If your partner is not returning to the property, s/he must write to the local Housing Office to confirm they are giving up their part of the tenancy. We can serve an Abandonment Notice on your partner if you do not have contact with them. Your partner must respond within eight weeks or you will become the sole tenant automatically. For more information, please contact your Neighbourhood Officer. Please contact your Neighbourhood Officer. We can serve an Abandonment Notice on your ex-partner to help you become the sole tenant. If your ex-partner is the sole tenant and is no longer living at the property, you have no legal right to live there. However, if you are married to the tenant you may have a right to claim the tenancy. Please contact your Neighbourhood Officer for more information. If you are the tenant and you die, the tenancy automatically passes to your husband, wife, partner or joint tenant. If you have no spouse, partner or joint tenant, a member of your family who is over 16 years old can inherit the tenancy if the house was their only or principal home at the time of your death. If your partner was the tenant and you were living with your partner, you have a right to inherit the tenancy. Please contact your Neighbourhood Officer for more information. No, if you have a Short Scottish Secure Tenancy no one will be able to take on your tenancy if you die. If you are not the tenant’s spouse or a joint tenant, you have no right to take on the tenancy and will have to move out of the property. If you are in this position, please contact your Neighbourhood Officer to find out how to apply for your own tenancy.